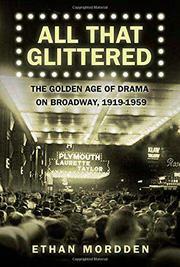 A scintillating take on Broadway drama’s finest decades. Anyone who wishes they had witnessed the Great White Way’s great past gets a second chance in this latest from Mordden (Beautiful Mornin’, 1999, etc.). A vivid stylist, he seats readers fifth-row center as Laurette Taylor in The Glass Menagerie, Marlon Brando in A Streetcar Named Desire, Alfred Lunt and Lynn Fontanne in almost anything collaborated with many others to bring American dramatic theater to heights that it seems it may never again climb. More than enlivening description, Mordden offers social, political, aesthetic and cultural context as he discusses what led to Broadway’s ascendancy and demise. He examines topics as diverse as the Depression, the Method, McCarthyism and stagecraft to explore the ways in which they shaped what happened on- and off-stage. Against this backdrop, he covers dramas justly and unjustly forgotten. He summons forth the now largely overlooked Rachel Crothers, arguing that she created a new form in her plays, from He and She in 1911 to Susan and God in 1937. He finds the themes in Life with Father worthy of Ibsen and Shaw, ranking Lindsay and Crouse’s long-running comedy along with Thornton Wilder’s Our Town as the two most underappreciated achievements in Broadway history. He suggests that Auntie Mame anticipates Stonewall and the emergence of gay voices on Broadway. But Hollywood, once at Broadway’s heels for scripts and stars, began to surpass it as cool, moody actors like Brando, Newman and McQueen went west to build another entertainment empire. Mordden’s keen eye, broad vision, wealth of detail and sparkling style bring to life the American rialto at its peak.